Sometimes experimental protocols require smaller fragments of IgG. Two commonly prepared fragments are monovalent Fab, following papain digestion, and bivalent F(ab’)2from digestion with pepsin. 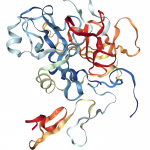 As with all proteolytic reactions, individual antibodies can have different susceptibility to different proteases so we recommend a pilot digestion using standard conditions before scale up. 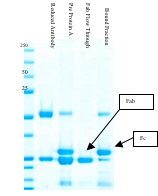 SDS PAGE gel of different antibody fragments following papain digestion and purification on Protein A agarose. F(ab) and Fc: Incubation with papain results in cleavage of immunoglobulin at the hinge region. Further purification on Protein A-agarose separates the antigen binding Fab from the Fc region. Fragments can be further purified and analyzed using size exclusion chromatography. F(ab’)2 : Cleavage with pepsin produces one F(ab’)2 fragment and smaller Fc portions. These fragments are useful for conjugation with detectable labels as the sulfhydryl group is still intact.